Well. Here's something all-new and all-different. This week's Waiting for is coming at you live, from my car. From a parking lot. Where I'm waiting for (Ha! Get it?) someone to run some errands. So, yeah, I'm blogging straight from the iPhone and I'm trying not to go (too) insane doing it. I'm gonna bet that I'll last another ten minutes or so, and then I'll throw this stupid, tiny little phone and its stupid, tiny little keyboard out the passenger side window. Mostly because there's a little lake out that window, and maximum damage is ensured. But before I do that, here's hoping I actually manage to write a little about some comic book-related stuff. First, though, a random musing (that will lead into comic book stuff--I promise). So. I was in the mall the other day, and I was inundated by Christmas/holiday shopping promotions and decorations. It's November, so I guess we are officially into That Season, though. Which is great and all. But as much as I love this time of the year, I think this is going to be a weird holiday. So many people are unemployed, and the economy is in such scary shape right now that I just can't imagine any across the board, big time spending this year. It's pretty depressing being unemployed; but being unemployed over the holidays is even more difficult. That overall feeling of the country, of course, is only going to add to the already-lousy state of the economy. I think the retail numbers are going to be historically bad come first quarter of next year, and I think that a bunch of independently owned shops are going to lose their long and valiant battles to stay afloat. To put it plainly, I'm worried about comics shops in this climate. People can't afford to buy gifts as they have in the past, so does that mean there will be more purchases for "needs" than there will be for "wants" this year? And will comics have any chance of falling into the "needs" category? I'd say no. There's more to it than just a lagging economy, though, when it comes to the comics industry and the holiday season. Typically, comics publishers hammer stores with new product in the final two weeks of the year, rushing to get things in before the year runs out and the items (which are usually delayed books from earlier in the year) become returnable. With things the way they are, though, will that trend continue? And if so, how will comics retailers hold up this holiday season? Will people buy comics, trades, and gift certificates for their loved one(s)? And, looking ahead, how many of today's comic shops are going to make it to next year's holiday? If sales are lagging into early next year, will the publishers maybe hold off on four- and five-dollar cover prices for new books? Maybe offer some cheaper trades? I think we all know the answer to those questions. (Here's a hint: it rhymes with no). From all accounts, it seems like DC and Marvel are making plenty of money, and comics are selling all over the place. Just not in comics shops. Now, I think some shops will thrive--the bigger, online chains will make money, for example. But how will the smaller shops fare? With trades much cheaper on Amazon and elsewhere, and with the continued push towards bookstores and online distribution, what will the comics retailer do to compete when so many people are going to be playing with much less spending money this holiday than they have in years past? Lots of questions, very few answers. Hopefully the publishers lighten the new comics load during the approach to Christmas week, and hopefully local shops understand that they may need to adjust some of their prices, or maybe even run big holiday specials to draw people into their shops. What can we do about all this? Well, I'm glad you asked. We can keep buying our floppies and trades from the stores we haunt, and hope that others do, too. But again, if you're in a position where there's a trade you just know a buddy will like, and it would make that perfect holiday gift, and it's almost 40 percent cheaper online...well. Still, let's root for the retailers this holiday season, and let's hope they're still around this time next year. And with that utterly depressing, Chicken Little view of things--let's talk about new (and awesome!) comics. First up this week we have a book that I have been waiting for, impatiently, since it was announced. From DC Comics, and written by Brian Azzarello, comes the Batman/Doc Savage Special. Now, full disclosure here. I know next-to-nothing about Doc Savage, other than the fact that he was a pulp hero. I do know quite a bit about Batman, though, and Brian Azzarello, too. He's one of my favorite writers, and I think his take on Batman (and, not to mention, Batman's villains) is one of the best presented in the comics industry. 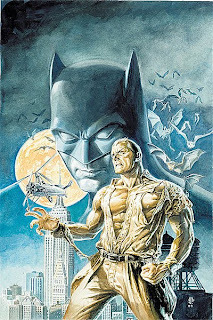 Doc Savage returns to DC Comics…and comes face-to-fist with the Batman! Superstar scribe Brian Azzarello (100 BULLETS, JOKER) and the breathtaking art of Phil Noto combine to shine the first light on a shadowy new version of the DC Universe, where the thugs run rampant, corruption runs deep, and even heroes can't be trusted! Doc Savage, the Man of Bronze, hates what he's heard about the connections between a grisly murder and Gotham City's violent new vigilante. But the Batman can't abide do-gooders getting in his way…and his .45 just won't stay in its holster! Be here for this vital prologue to an upcoming 6-issue miniseries by Azzarello and Rags Morales (IDENTITY CRISIS), which will pull back the curtain to reveal the full width and breadth of DC's new pulp-influenced universe. The book has more pages than usual, and it includes some nice extras. For $4.99, DC has found a way to load this up with (new) content, and make it worth your hard earned pay. Next up, we have an interesting addition to the Warren Ellis library. 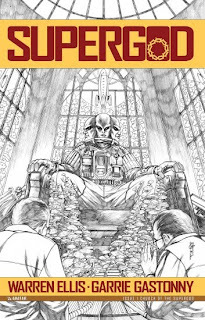 From Avatar Press, Supergod issue one hits this week, and it promises to be another trippy, bloody, dismal Ellis take on super powered beings. SUPERGOD: praying to be saved by a man who can fly will get you killed. From the creator of THE AUTHORITY and PLANETARY comes the craziest and most horrifying superhero comic you've ever read! In the world of SUPERGOD, superhumans are the ultimate expression of the Messiah complex, and scientists can build Messiahs who will fly down from the skies to save the world. No-one thought about how they'd do it--or even if they'd want to. So begins the apocalyptic tomorrow of SUPERGOD--the story of how supermen killed us all and ended the world just because we wanted to be rescued by human-shaped things from beyond Science itself! Take every superhero comic ever published, shove them into a nuclear-powered blender, soak it in bad vodka and set the whole thing alight--and SUPERGOD will crawl out and eat your brain! This five issue color series is drawn by Garrie Gastony with colors by Digikore. SUPERGOD is available with a Regular cover painted by Felipe Massafera, a Wraparound by series artist Garrie Gastony, and a special retailer incentive Church Of Supergod Edition! See? I told you it was great. And, um, insane. But, as any Warren Ellis fan knows, his books usually fall into those two categories--great and insane. Now, personally, there's some Ellis stuff that I absolutely love. Like Frankenstein's Womb, the story of how Mary Shelley came up with the idea for Frankenstein. It's a brillaint, haunting tale, beautifully rendered in black and white, and it's become my favorite Ellis comic. Or his first prose novel, Crooked Little Vein, which is the most messed-up little detective story you'll ever read! But, sometime Ellis delves too deeply into techno-babble, as he did in Doktor Sleepless and No Hero, and he just plain loses me. But, as I do with all of his new books, I will be giving Supergod a chance. And with that, I'll be saying fare thee well. Thanks for listening, and enjoy this week's comic goodness! Oh, and...what are you Waiting for?